You Have Truly Blessed Our Life! generates excitement in every photo causing the photos to be so unique. photography, she truly has blessed our life. Jason and I couldn't be more thrilled with our pictures. I'm not sure we have the right words to express our gratitude. Jason and I truly feel that our pictures are the most special we've ever seen...they are so creative, unique, and beautiful. You captures so many small, tender moments that I wasn't witness to on the wedding day with everything going on, but when I saw my pictures, I felt as though I never missed a moment of a single thing that happened to anyone on my day. When Jason and I looked at all the pictures, we went slow...kind of like a faulous book that you never want to end because you want to savor each moment of it. I feel it was one of my greatest blessings to have found you because each moment of my wedding that holds a special place in my memories has somehow been magically captured in the pictures you took. The level of care, enthusiasm, respect, and kindness you showed my entire family and wedding party leading up to the wedding day, during the day and afterward far surpassed any other wedding vendor I worked with. When I encountered stress on my wedding day, you were the one rallying my friends to be supportive. Not only did you care about the pictures I wanted to take, but you took time to help me plan every detail of my day so that it was exactly what I had hoped for. My dad took a picture of you laying on a dirty street upside down to take a picture. He has mentioned several times that he can't belive that you have that degree of devotion. I keep telling him I can...not only have you provided us priceless wedding pictures, but the friendship we now share means as much to me. I look forward to filling my house with a lifetime of artwork, pictures done by Flashes...Teri, we love you! Thanks for everything! 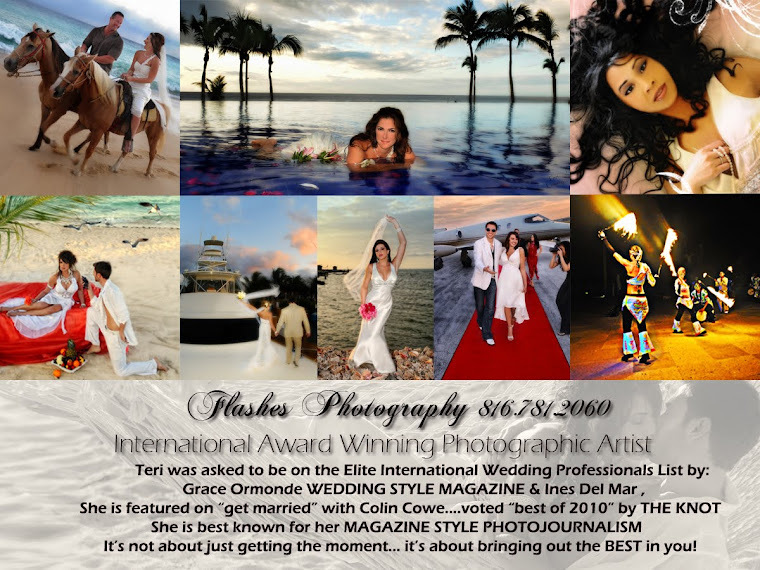 Just wanted to give a big bog hug and thank you to Teri and Jennifer with Flashes Photography! You are both such great people to work with and I absolutely love my pictures!!!!!!! They look like they came straight out of a magazine! Everyone comments about how great you were (Teri) and how much fun we had taking pictures all over KC! Thanks for being so great!! Had to drop you a line to let you know how incredible our photos turned out. Greg and I both wanted something a little different from the "traditional" wedding photos that most of our friends had taken at their weddings. After living in New York for the last 5 years, I knew that I wanted a more modern, contemporary look (Black and white, photojournalistic, etc) for my wedding and your photos look even better than some I have seen from photographers straight out of NYC! The funny thing is, some of the people who have seen the pictures assumed that you were a New York photographer and that we had flown you in for the wedding! I have enjoyed telling everyone that you are actually from KC! Thanks again for making our wedding so special. We will cherish the pictures and how you were able to capture our special day for the rest of our lives!